The EasyCoder E4 provides a reliable thermal transfer and direct thermal printing solution in numerous environments. 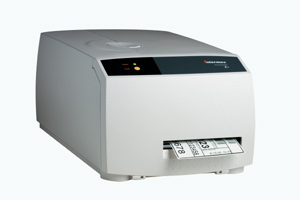 Compact in design, the EasyCoder E4 printer is ideal where space is limited and performance is required. For quick and easy printing, the printer is supplied with Intermec's Connect and Print features: LabelShop START Label Design & Print software, InterDriver with ActiveX controls Windows driver, parallel computer connection cable, and sample roll of labels and ribbon.